A new study by Prof. Daniel Fischel of the University of Chicago Law School and co-authors Christopher Fiore and Todd Kendall of economic consulting firm Compass Lexecon finds that both the Colorado Public Employees’ Retirement Association (PERA) and the New York State Common Retirement Fund stand to lose millions every year if they were to fully divest from fossil fuels. In response to increased pressure on Colorado and New York politicians to support divestment, the report—which follows up on their earlier study of pensions in other states—examines the potential impact of a narrow divestment policy that includes oil, natural gas and coal, as well as a broad policy that also includes utility stocks, to determine the financial implications of such an investment strategy. To do so, Prof. Fischel and his team used all available data on current holdings to calculate returns on those holdings over the past 50 years. This data was compared to an otherwise identical risk-adjusted portfolio absent of fossil fuel-related stocks. Accordingly, when adjusted for risk, Colorado’s annual cost of divestment could range from $36 million for narrow divestment to $50 million for broad divestment. Over a 50-year timeframe, that cost skyrockets to between $470 billion under the narrow policy and $646 billion, or a 10.12 percent loss, under the broad policy. 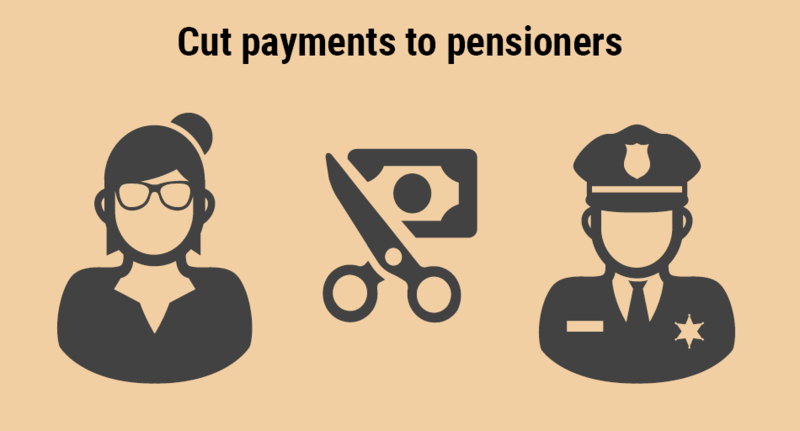 These loses are equivalent to cutting individual pension payments to Colorado beneficiaries by $300 to $400 annually or cutting annual benefit payments to roughly 1,000 Coloradoans. For New York’s $190 billion pension, the expected annual cost of divestment ranged from $136 million for narrow divestment to $198 million under the broad strategy. To put these numbers into perspective, the average pension for retirees in the Employee’s Retirement System (ERS) was $23,026 in FY 2017. A $198 million loss due to divestment equals the yearly pension payments for 8,598 ERS retirees. Over 50 years, the costs of divestment for New York State add up to $1.1 trillion under the narrow approach and $1.5 trillion under the broad approach. To make up for the substantial shortfall caused by divestment, the State will either have to lower pension payouts or seek new revenue from taxpayers. The report comes following previous academic research commissioned by IPAA on the subject of fossil fuel divestment. While this report focuses on impacts of divestment due to diversification loss, the impacts of giving up investments in fossil fuels are likely to be higher when combined with other factors like transaction costs associated with selling investments and compliance costs associated with adhering to a “fossil free” portfolio. This report follows a previous 2017 study that quantified divestment’s impact on the California Public Employees’ Retirement System (CalPERS), as well as public pension funds in New York City, Chicago, and San Francisco. Fischel and his team calculated that the 11 funds analyzed would lose up to a combined $4.9 trillion under a broad divestment regime. In the case of CalPERS alone, the total cost of divestment was estimated to be up to $289 million per year. Copies of previous reports, fact sheets and other collaterals can be found here.